President Maithripala Sirisena, in assurances given to civil society representatives, has clearly implied that the prosecution of certain individuals suspected of wrongdoing was in the hands of the political leadership, namely himself and Prime Minister Ranil Wickremesinghe and not necessarily a matter for law enforcement and prosecuting authorities. Rajapaksa is accused of misusing state funds to construct a memorial for his father at Weeraketiya. 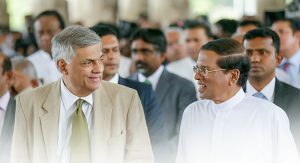 Earlier, Colombo Telegraph revealed that the Attorney General had sought Wickremesinghe’s approval for the arrest, to which the Prime Minister had responded saying that it was up to the AG to do what was required. Colombo Telegraph reliably learns that the delegation, following the meeting, had expressed doubts among themselves with respect to Sirisena’s assurances, illegal though they are. ‘ekata aappa kaala avith viruddhava chande illapu eka ne,’ (he’s the one who, having had hoppers [with Mahinda Rajapaksa], came out and announced he would contest [Rajapaksa]) they had mused. The delegation comprised Ven. Dambara Amila, Prof. Sarath Wijesuriya, K.W. Janaranjana, Saman Ratnapriya and Viyangoda.